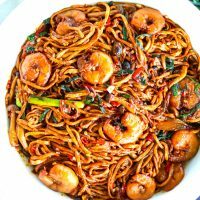 This Stir-fried E-fu Noodles with Shrimp is quick and easy to make, loaded with mushroom and soy sauce umami flavors, and super delicious! It’s perfect for special occasions like Chinese New Year, but also great for simple weeknight dinners! For the Noodles: Boil about 2,400ml of water in a large pan/pot. Once the water is boiling, add the noodles and cook until they have separated into strands but are still firm – about 3-4 minutes. (Be careful not to overcook them, as they will become too soggy when you stir-fry them later. The goal is to soften them up just enough before you stir-fry them.) Drain the water and set aside in a colander. Run some tap water over the noodles to prevent them from sticking. Make the Shrimp Marinade: In a large bowl, mix all the ingredients for the shrimp marinade. Add the shrimp, mix to coat, and set aside. Sauce Bowl: In a medium bowl, add all the ingredients listed under “Sauce Bowl” and mix thoroughly with a spoon to combine. Set aside. Prep for Marinated Shrimp: Heat 2 TBLS peanut oil and a dash of sesame oil in a wok or large pan over high heat. Lift the wok and swirl it in a circular motion so that the oil spreads around the perimeter and then place it back on the stove. Once hot, add the shrimp and spread them evenly in the wok. Cook on one side for about 30-45 seconds, then flip and cook on the other side for 30 more seconds. Toss until no longer translucent, then transfer to a fine mesh strainer and hold above the wok to let the oil drain. (You can gently shake the strainer to speed up the draining process, but be careful not to shake too violently as that’ll cause some of the cornstarch to come off and make the shrimp a bit mushy.) Transfer the shrimp into another clean large bowl and set aside. Discard the oil in the wok and wipe with paper towels. Set back on stove. Heat the remaining 2 tablespoons of peanut oil, chili oil (if using), and about 1 TSP of sesame oil in the wok. Lift the wok and rotate it in a clockwise motion to spread the oil around the perimeter. Set it back on the stove to let the oil heat up for a minute. Once hot, add the onions and sauté until translucent – about 1 minute. Add the garlic, ginger, and Chinese chives whites and stir-fry for 15 seconds. Then add the red chilies and continue stir-frying. Add the shrimps and toss with the rest of the ingredients in the wok to combine. Mix the contents of the sauce bowl with a spoon (to loosen up the corn starch), then add the noodles and pour the sauce over them evenly. Stir-fry and toss continuously to ensure that everything is combined and coated well in the sauce. Season with black and white pepper to taste and continue stir-frying. Add the greens of the Chinese chives and stir-fry to combine. Cook until they turn radiant green – about 1-2 minutes. Continue tossing and stir-frying everything until the noodles have heated through, then turn off the heat and transfer to a serving dish/plate. To serve: Serve the noodles with Chinese chili oil and crushed red chili pepper on the side if desired (optional). Deseed or reduce the amount of red chilies if less heat is desired. You can also omit them entirely if you like. Chinese chives (also known as garlic chives) are different than your normal chives. They can be found at Chinese grocery stores in your local Chinatown. I’ve also heard of people finding them at farmers markets in their locality too. You can find the e-fu noodles in either a noodle shop in your local Chinatown (if there is one in your town) or at an Asian grocery store. The latter will be a packaged version and likely one that comes with seasoning packets, which you can discard to make this recipe. Here in Hong Kong, I’ve also seen Sau Tao brand of e-fu noodles available at supermarkets, but for this recipe I purchased the e-fu noodles disc from a noodle and dumpling wrapper shop near my local wet market. See what you can find in your locality!